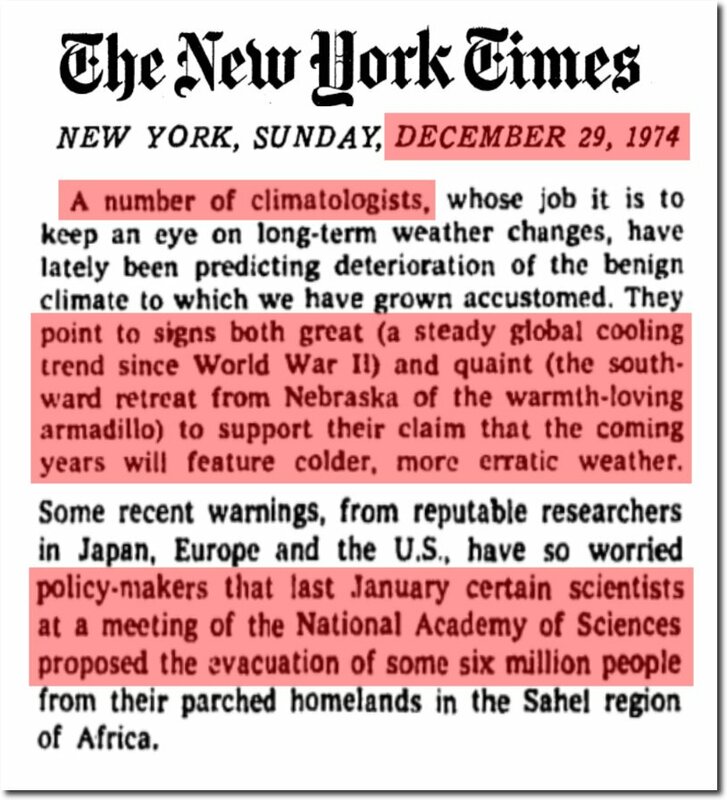 Academics have been forecasting doom for my entire life. 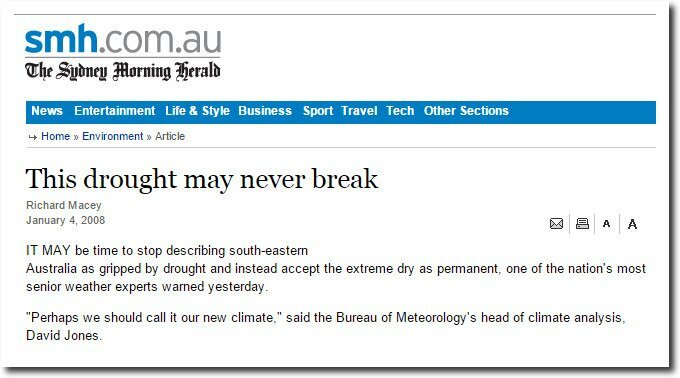 Needless to say, it hasn’t happened, as we are still here. 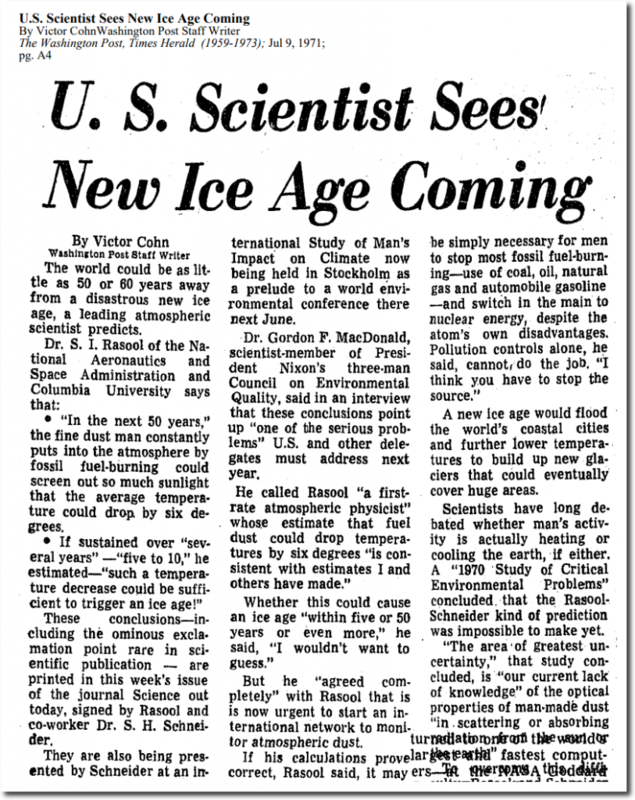 A few days after we landed on the moon 50 years ago, Stanford professor Paul Ehrlich forecast that we would disappear in a cloud of blue steam within 20 years. 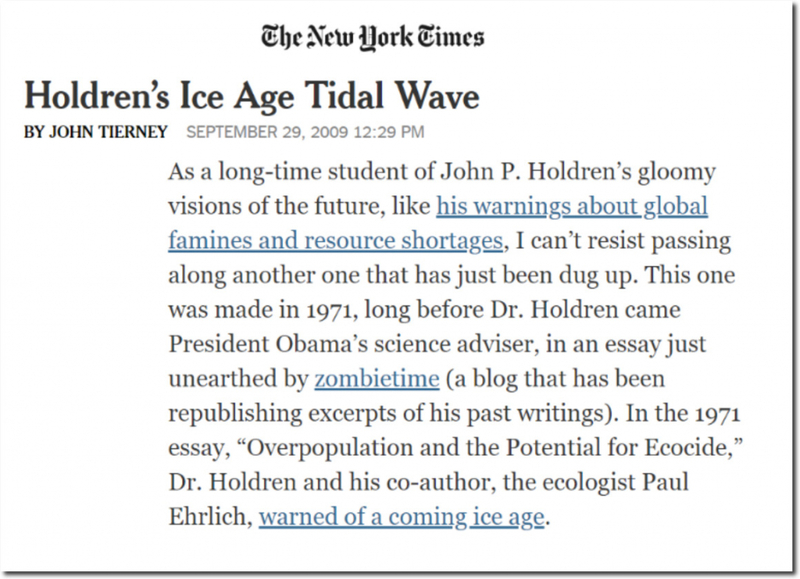 Ehrich is John Holdren’s close associate, and Holdren was Obama’s science advisor. 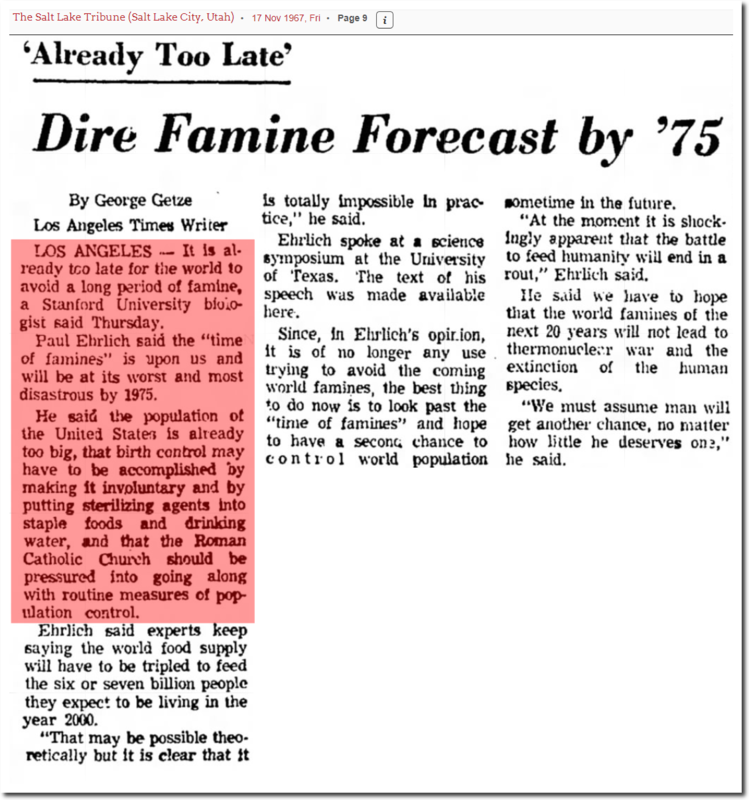 A year later, he predicted that we would run out of food and water within a decade. 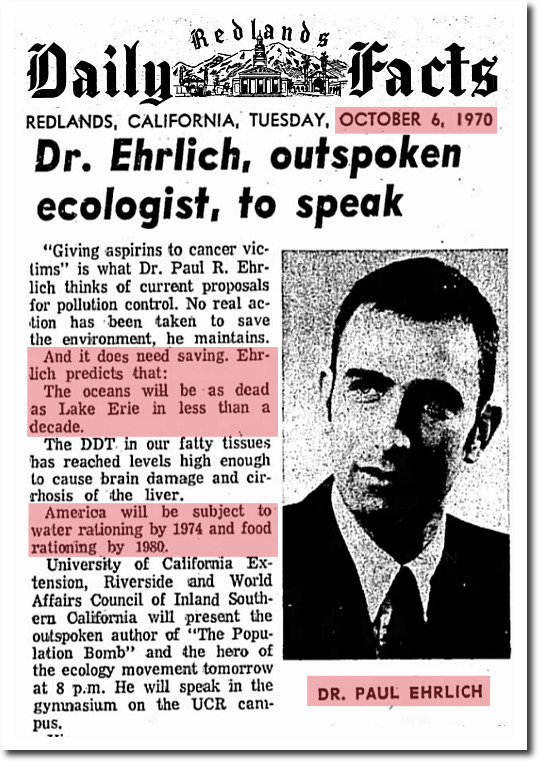 He wanted to poison Africans in order to save them from overpopulation. 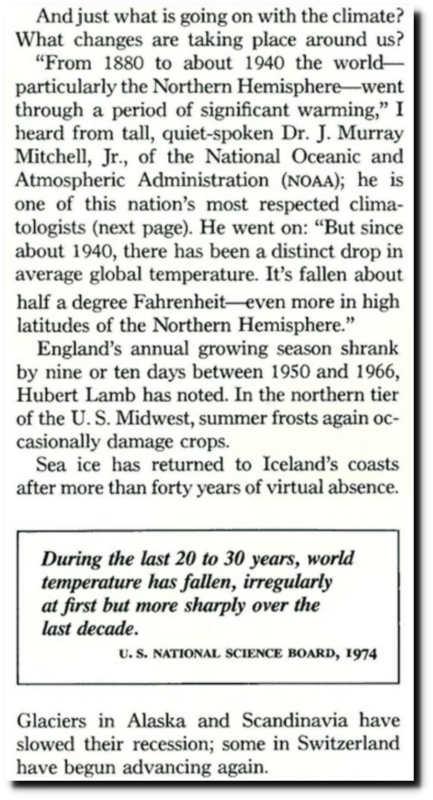 A few years later the “immensely likeable” Ehrlich jumped on the global cooling bandwagon. 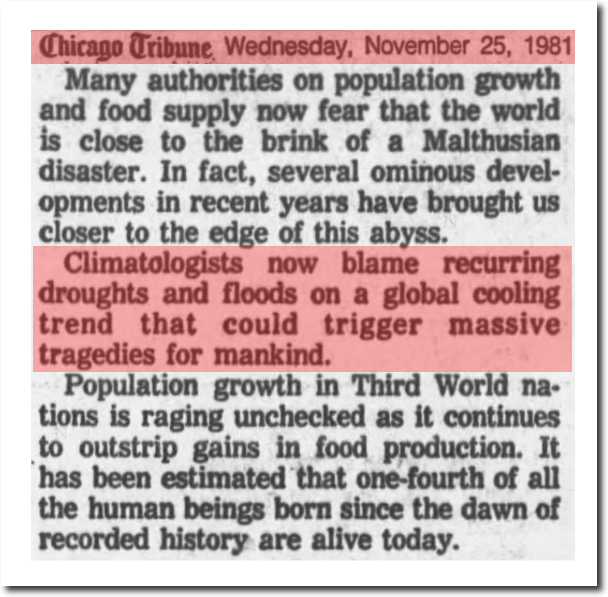 Obama and Holdren were both pushing global cooling, before they started pushing global warming. 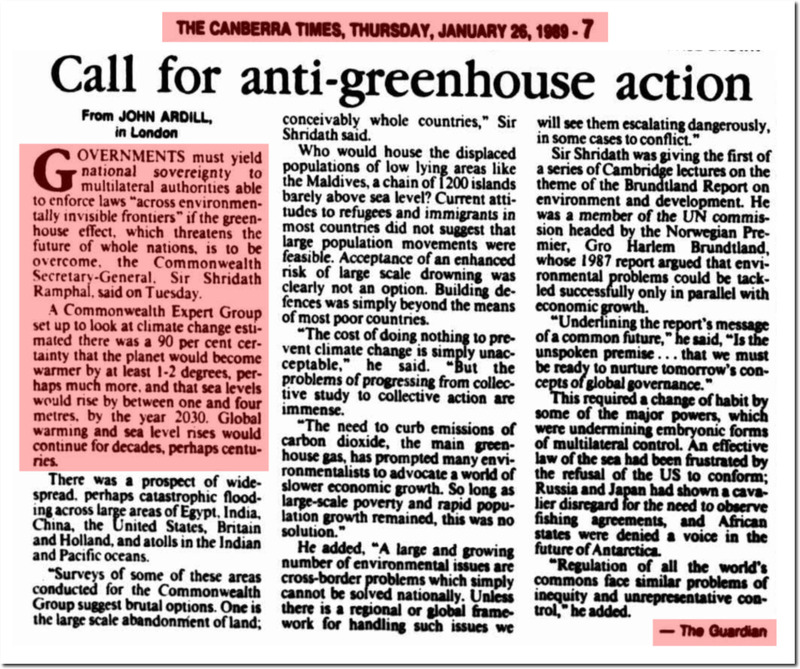 Their real agenda was to cut off the fossil fuel supply, which they were blaming for the global cooling. 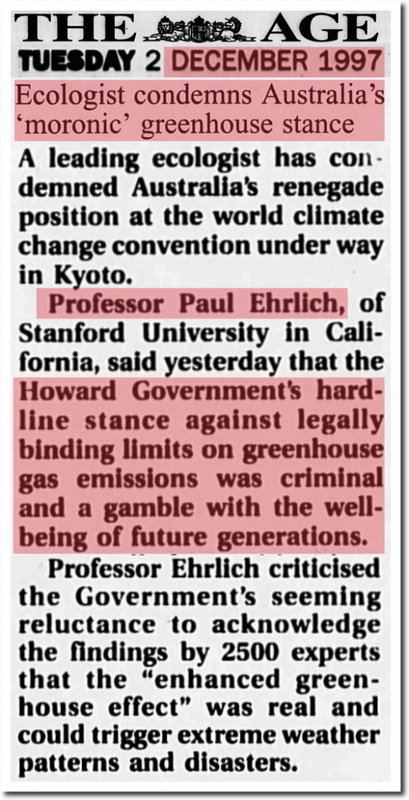 Twenty years later he wanted to prosecute climate skeptics. 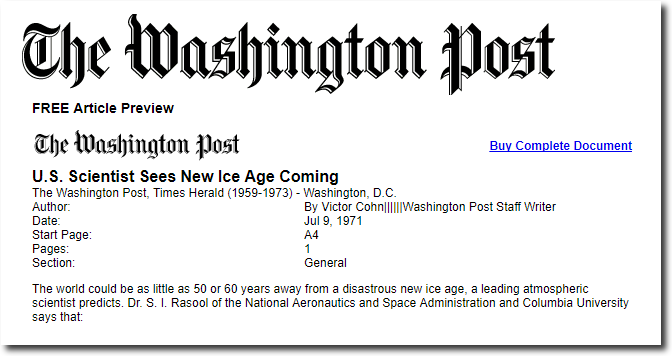 And 50 years after his first failed predictions of doom, he is still at it. The global cooling scare was ubiquitous for academics. 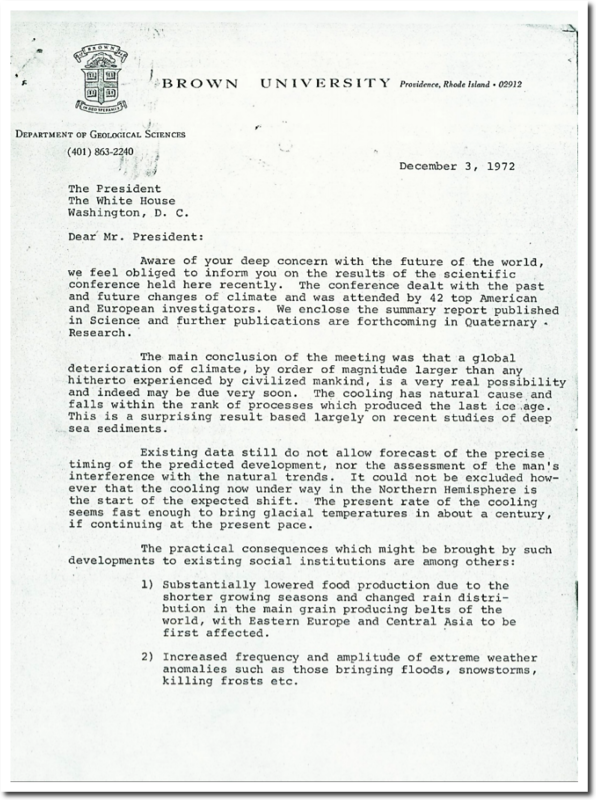 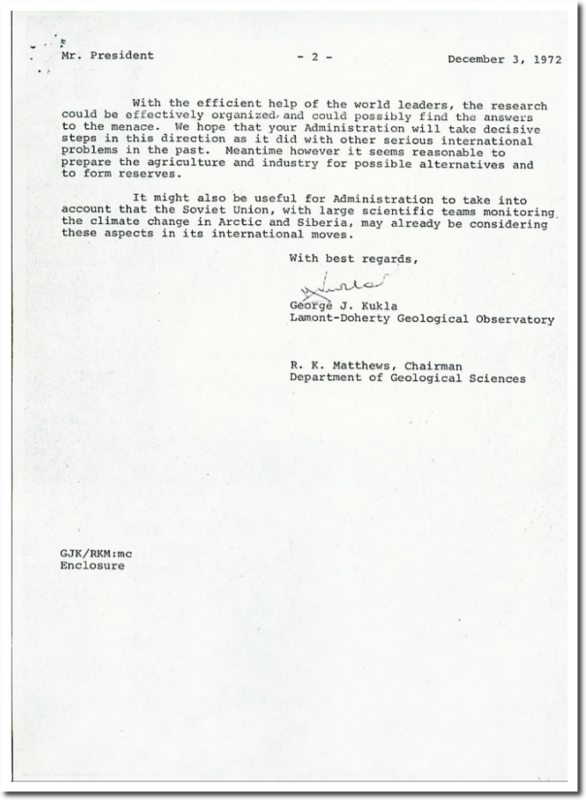 The world’s leading climate experts wrote a letter to President Nixon in 1972 warming of a new ice age in about a century. The Director at the National Center for Atmospheric Research and his leading scientist were pushing global cooling. 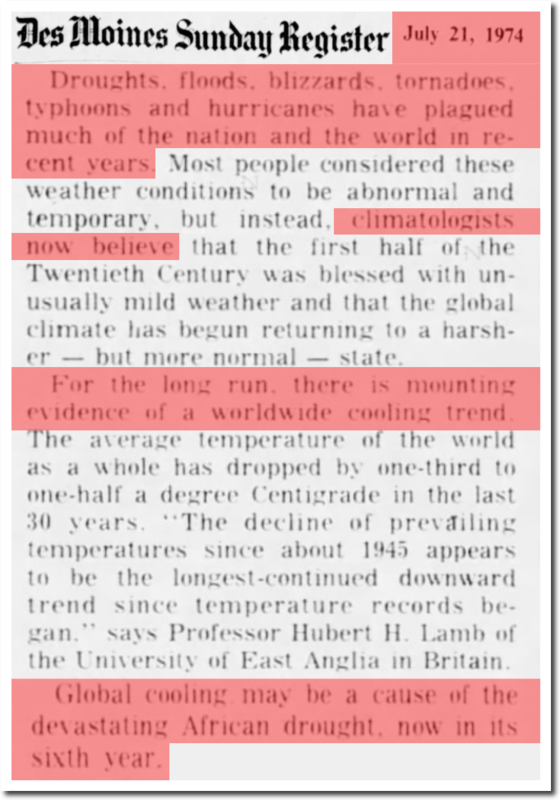 Climate experts wanted to melt the Arctic to stop global cooling. 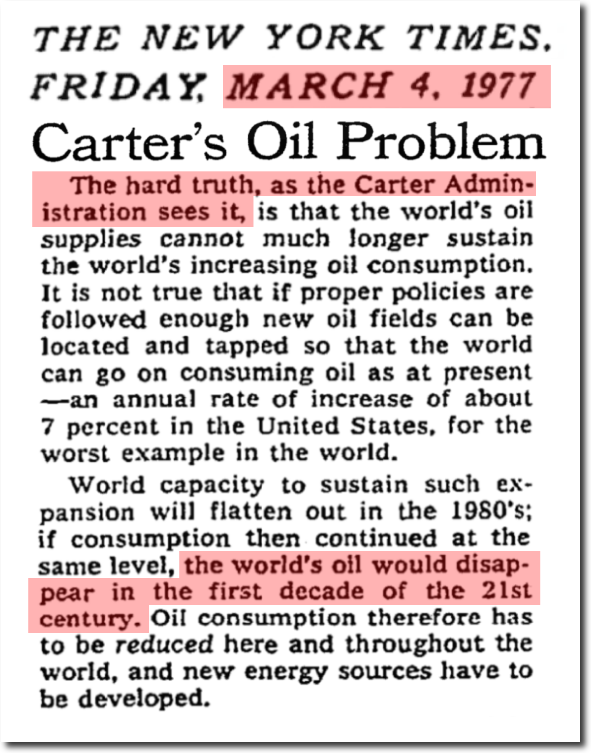 President Carter warned that we would run out of oil at the beginning of the 20th century. By the end of the 1970’s academics started to move on to new panics – nuclear meltdown. 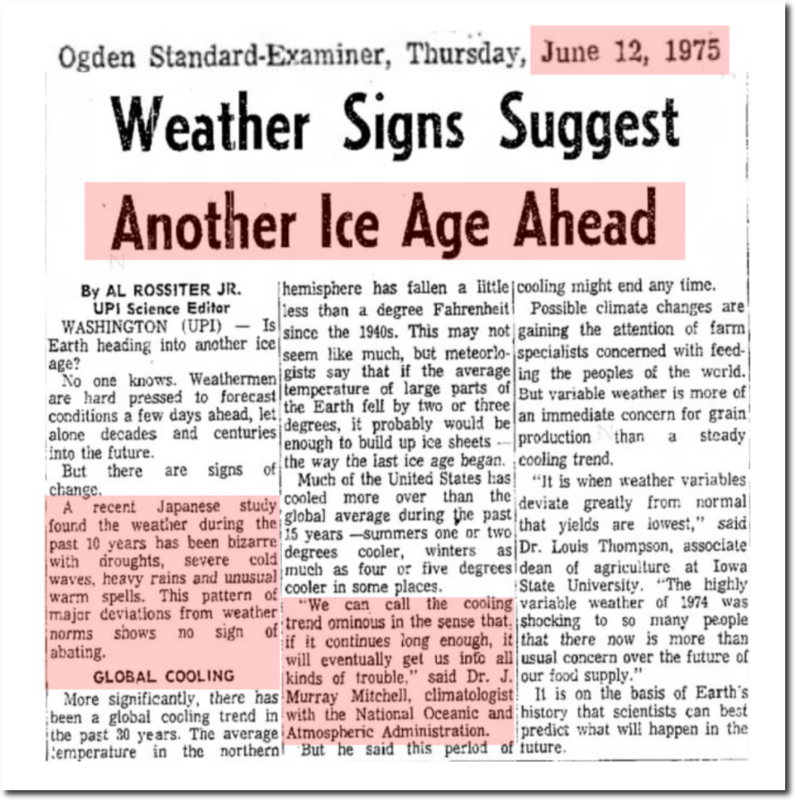 In 1979, experts said global warming would produce a new ice age. 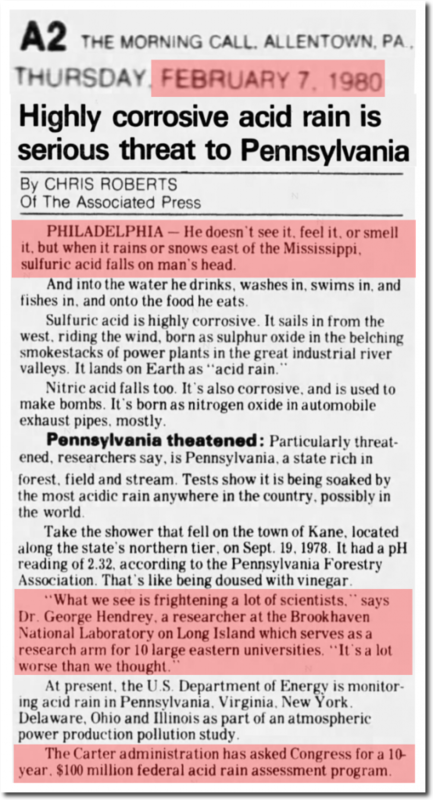 Acid rain was going to kill us if famine, global cooling, nuclear meltdown and peak oil didn’t. 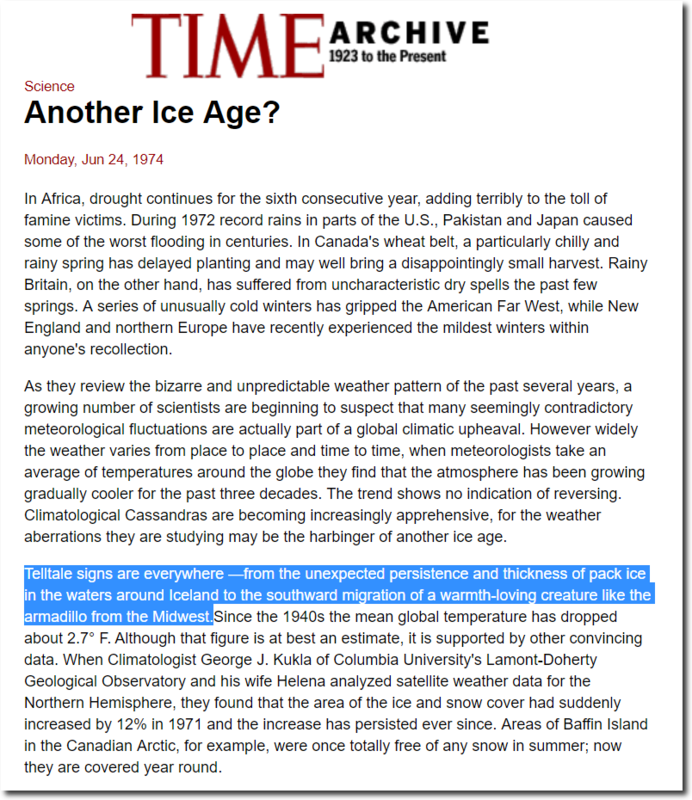 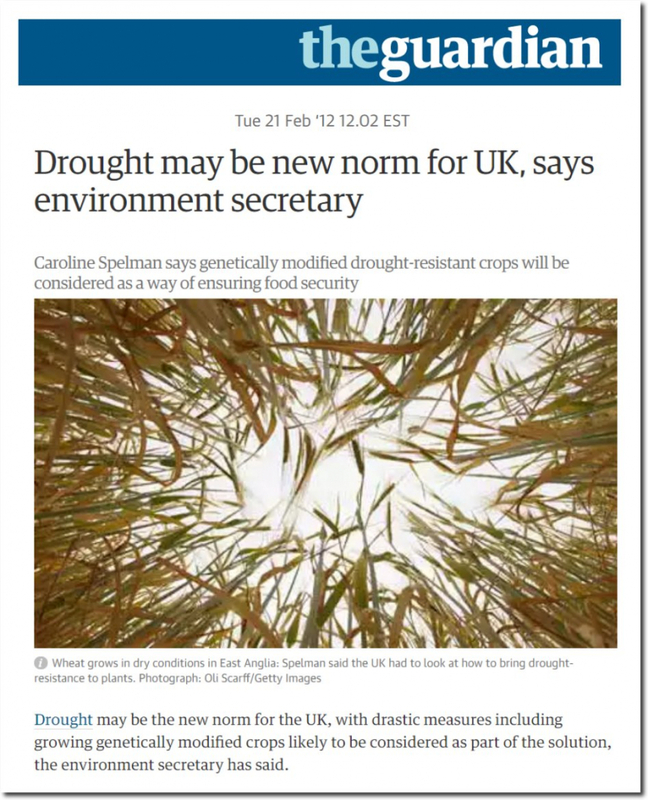 Global cooling caused droughts and floods. 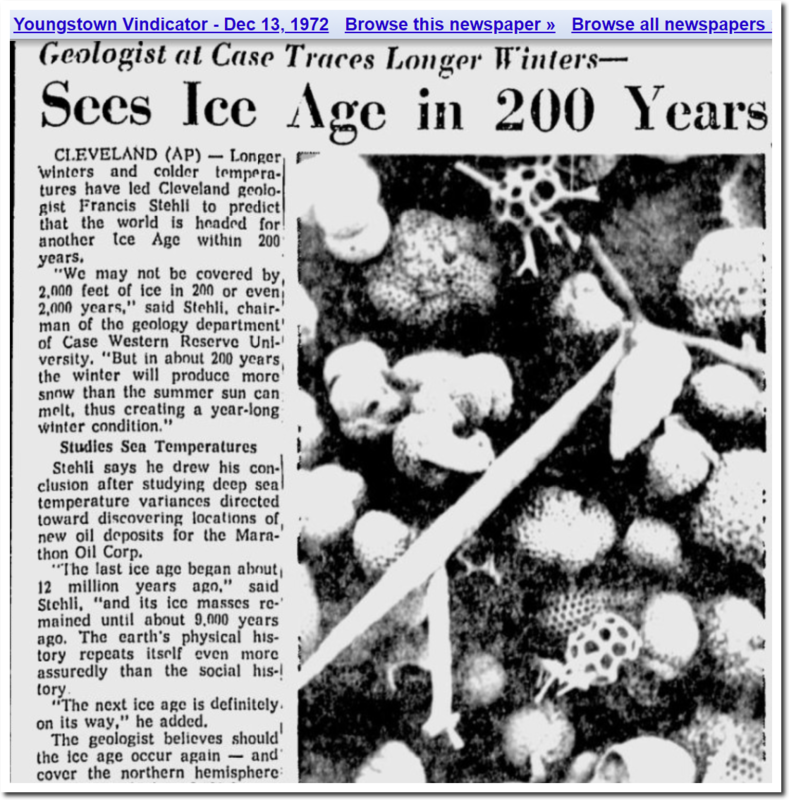 Now they are caused by global warming. 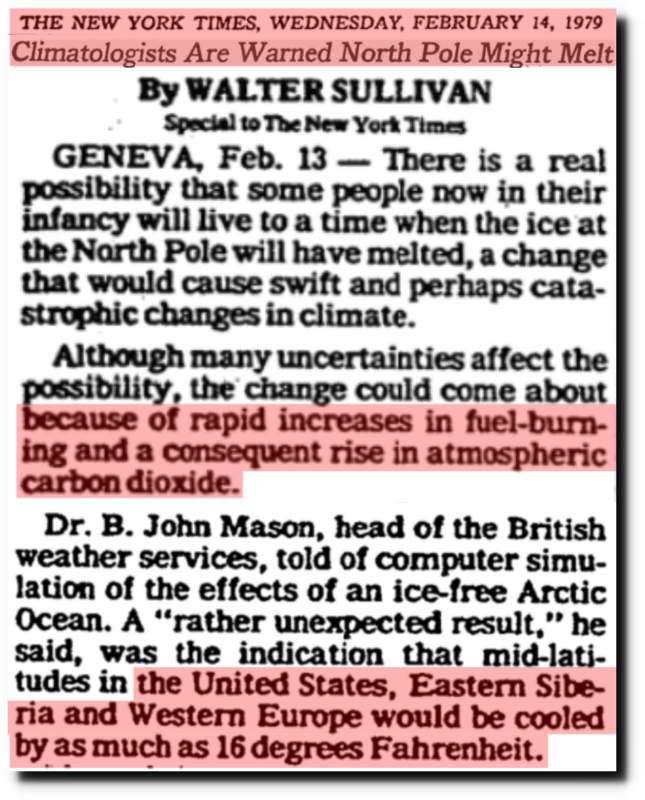 But times changed during the 1980s, and the UN warned that global warming would kill us by the year 2000. 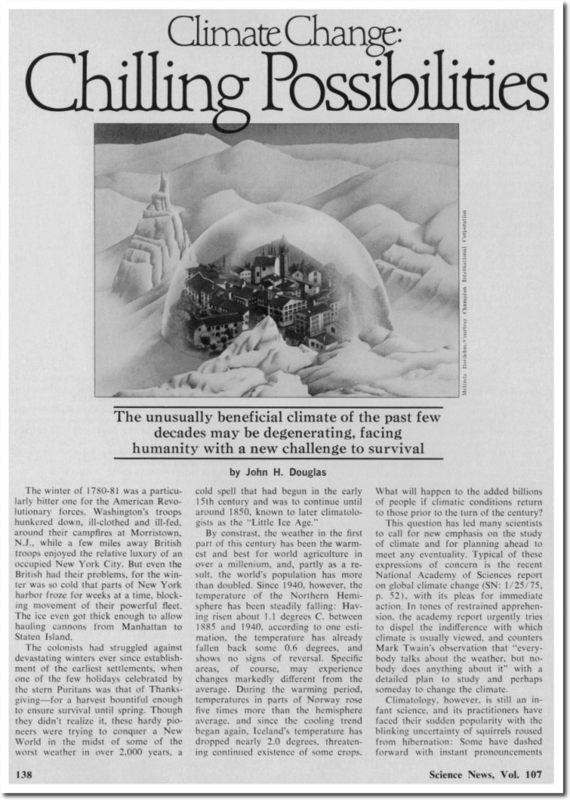 That doesn’t seem to have happened, so they pushed the new doom date out to next year. 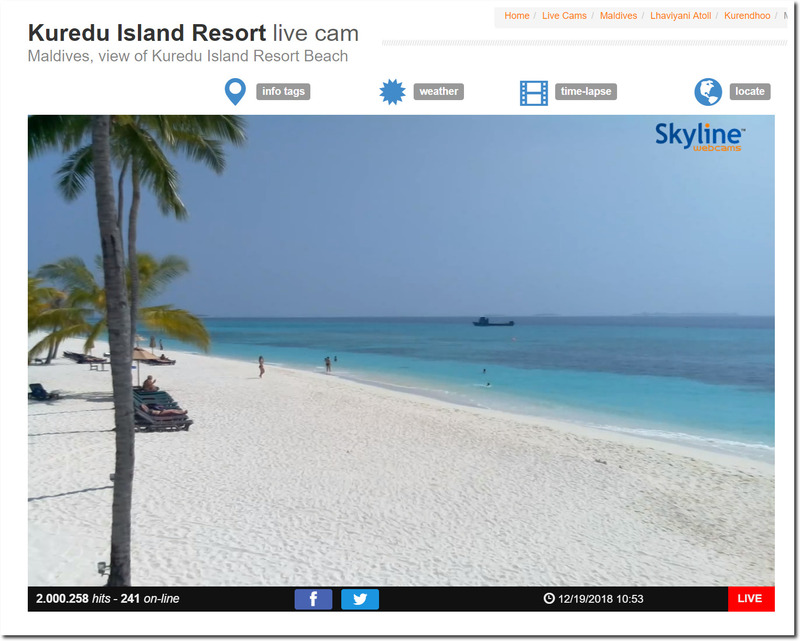 Experts said the Maldives would be underwater by now. 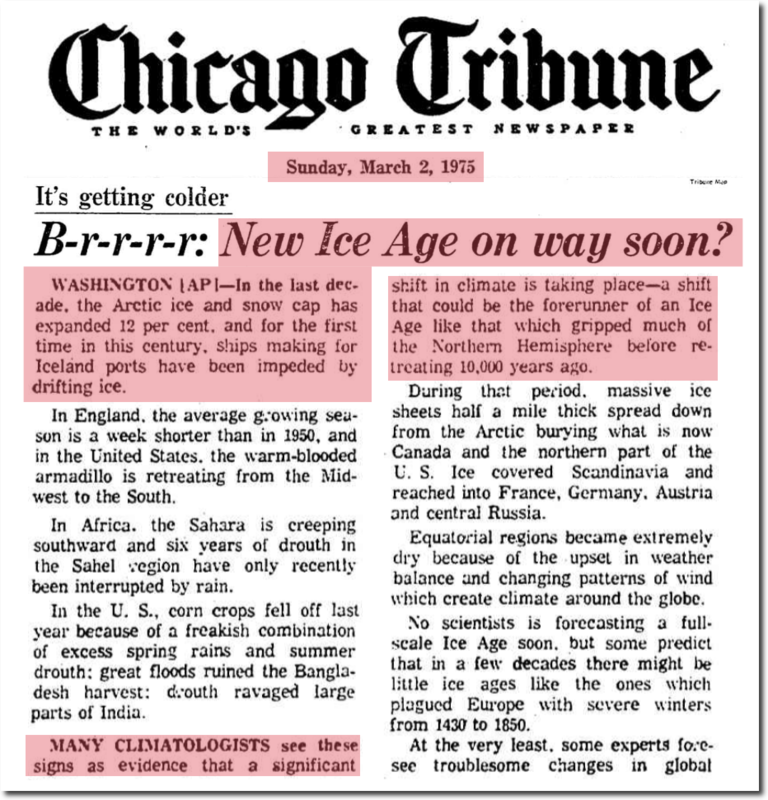 But the Maldives seems to be OK.
NASA’s James hansen predicted Lower Manhattan would also be underwater by 2018. 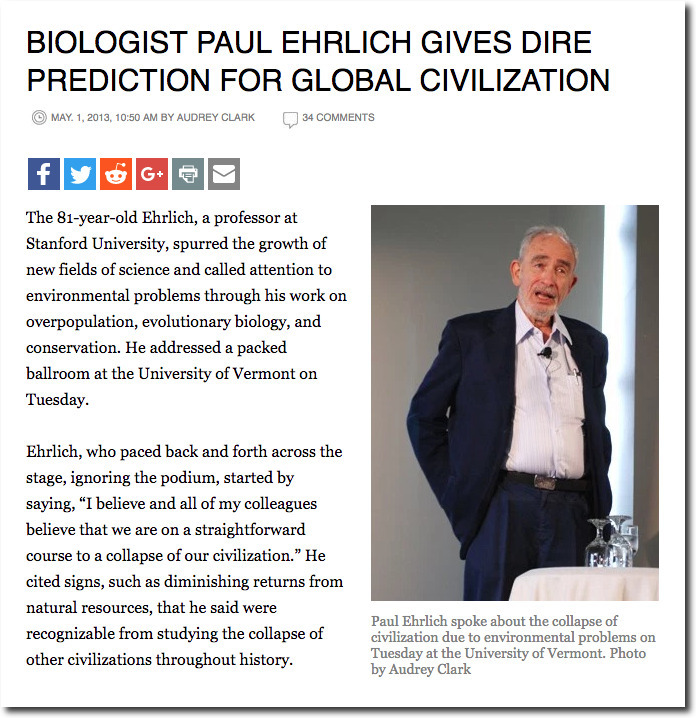 Paul Ehrlich declared that anyone who doubted his forecasts of doom, was a criminal. 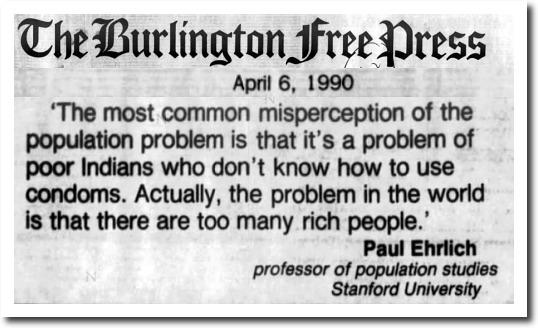 He called for genocide against “rich people” like himself apparently. 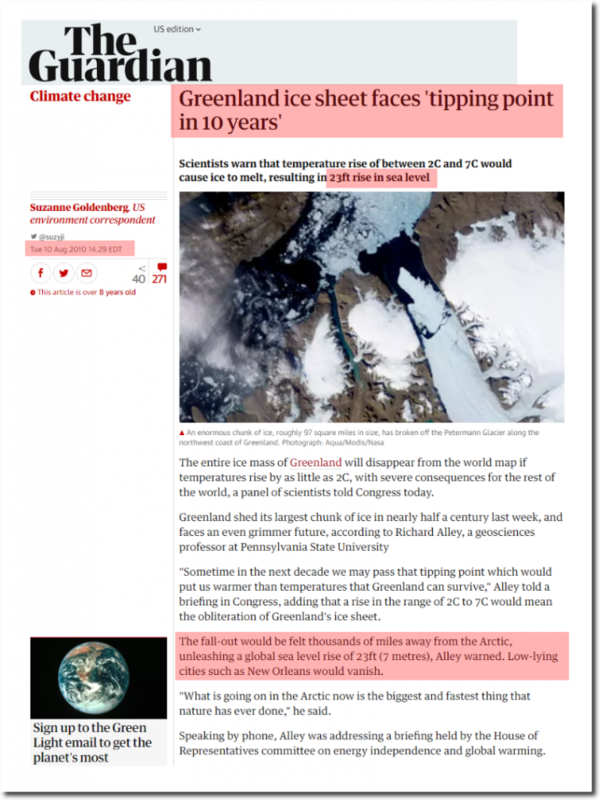 The world’s leading climate scientist predicted the Arctic would be ice-free by 2018. 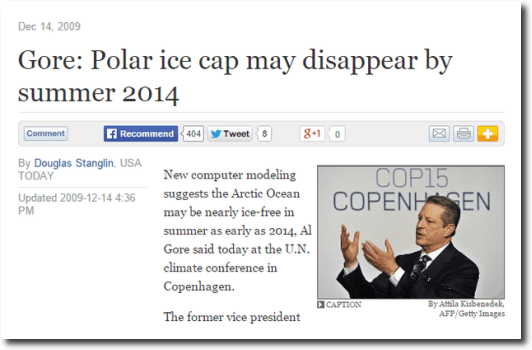 Nobel Laureate Al Gore predicted the Arctic would be ice-free by 2014. 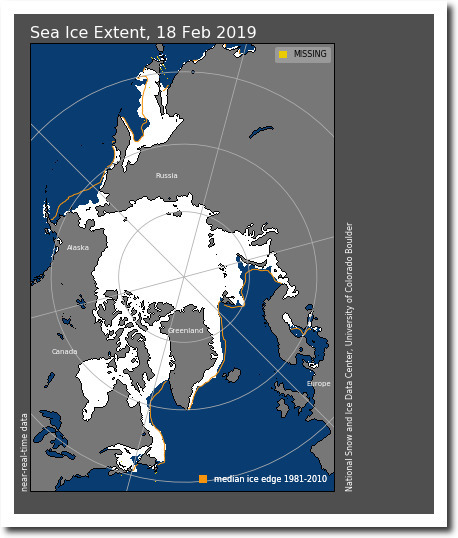 There seems to be lots of ice in the Arctic. 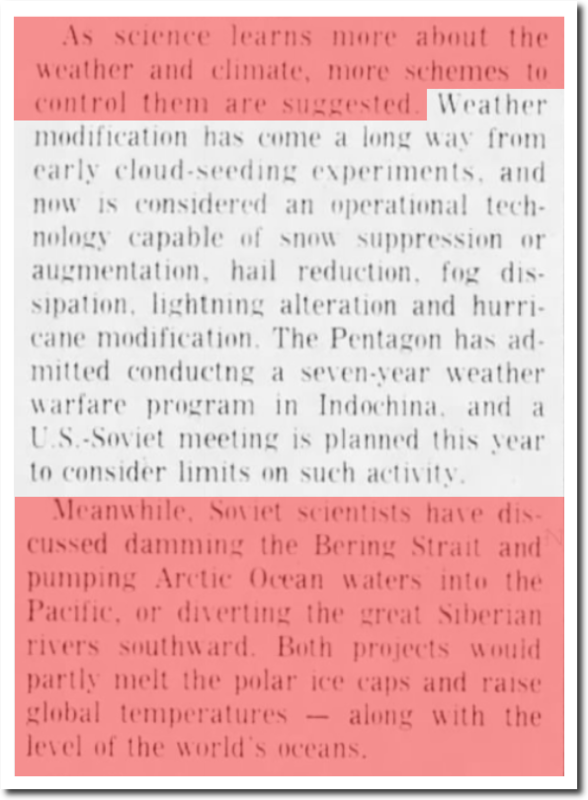 In 1989, the Guardian said that only global communism can stop twelve feet of sea level rise. 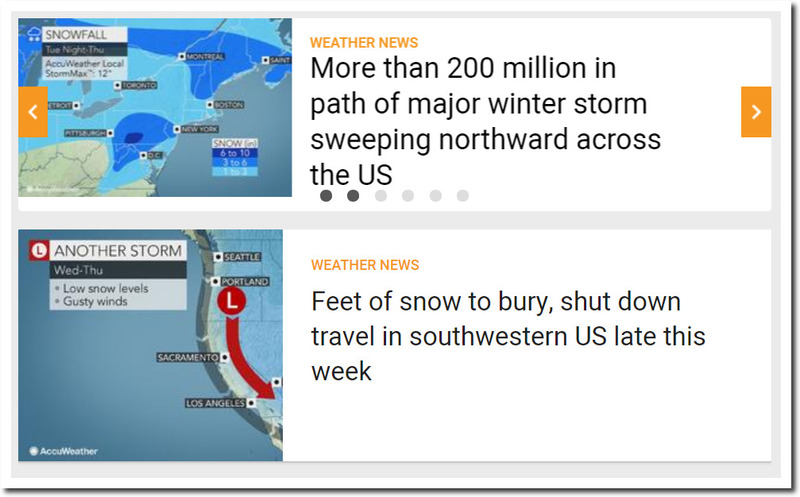 One failed forecast after another. 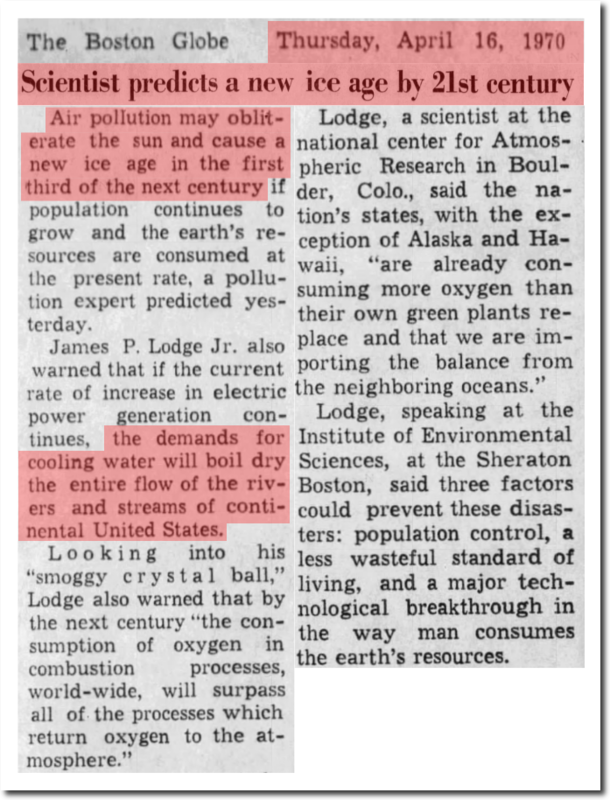 New Orleans to drown by next year. 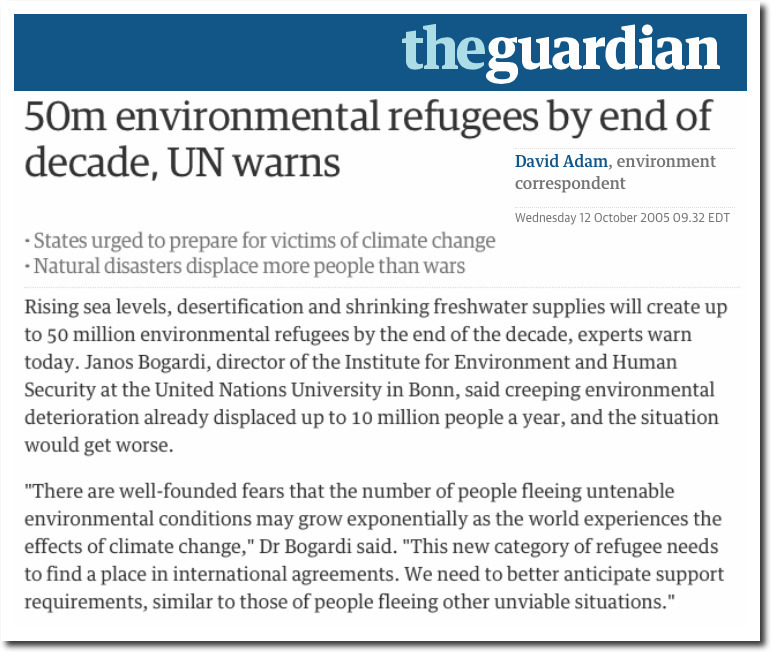 Fifty million climate refugees by the year 2020. 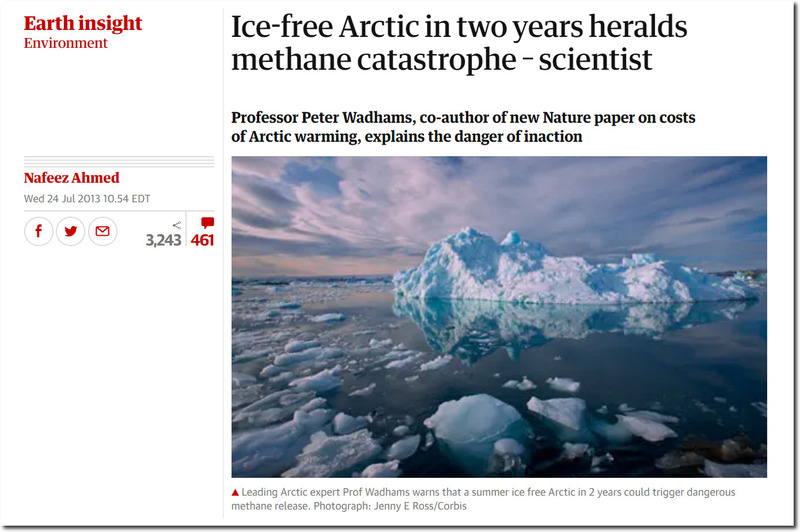 Global warming will kill us and make Britain a Siberian climate by next year. Permanent drought in the UK. 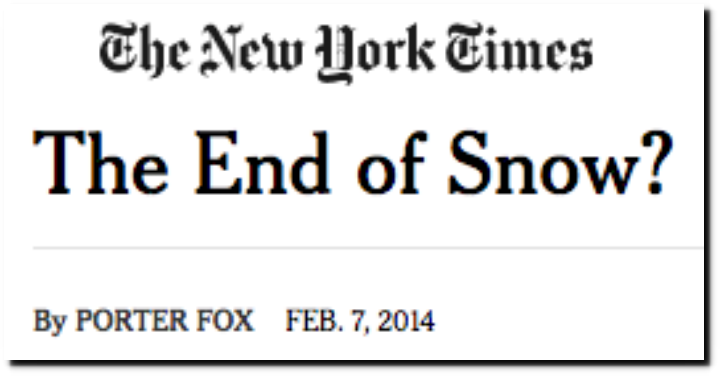 Five years since the New York Times announced the end of snow. It has been more than twelve years since they announced the endless summer. The Washington Post predicted cherry blossoms blooming in winter. 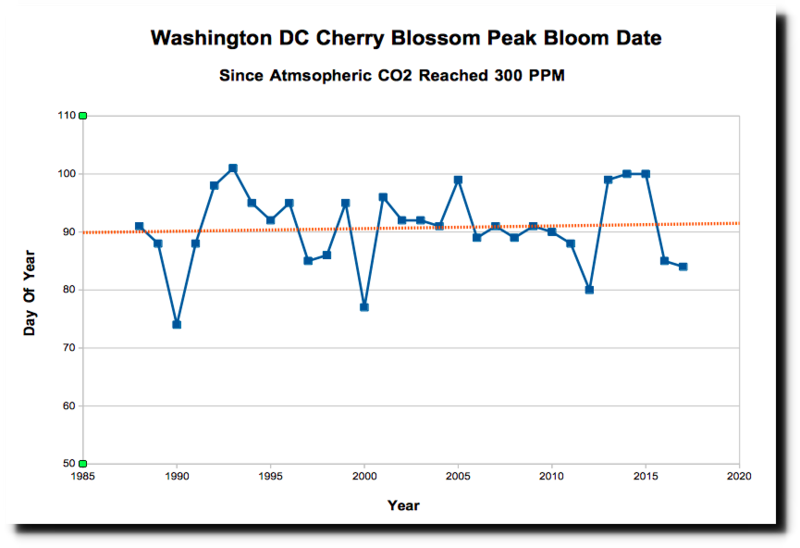 There has been no trend in cherry blossom bloom dates since atmospheric CO2 reached 350 PPM thirty years ago, with recent years tending to be late. 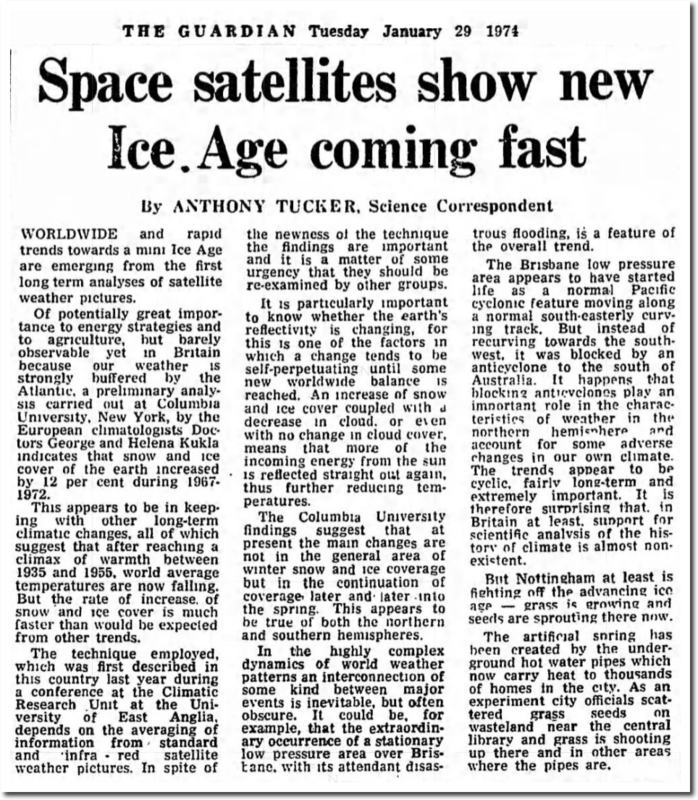 And it has been almost nineteen years since British experts announced that snow is a thing of the past. Actual snow cover has been increasing for 30 years, and is about the same as 50 years ago. 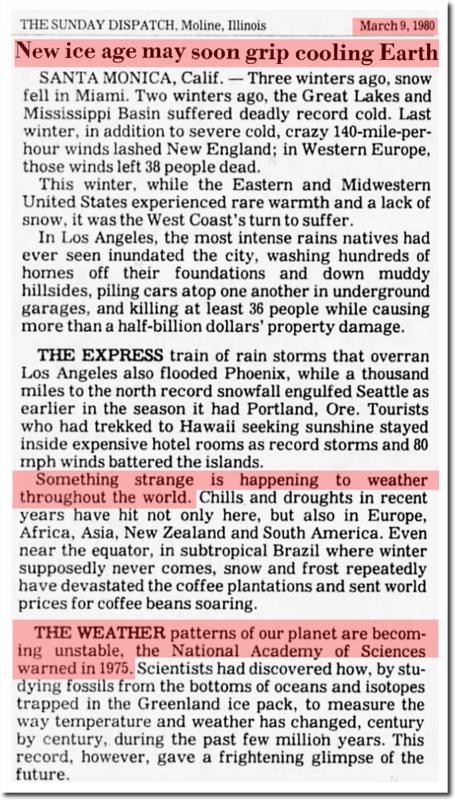 Bill Clinton’s science advisor announced the Southwest permanent drought eight years ago. 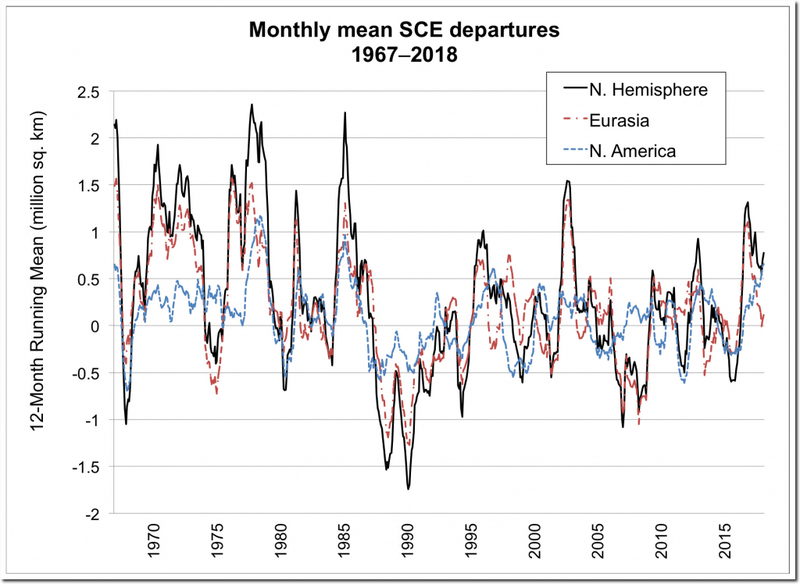 Those forecasts don’t seem to be doing too well. 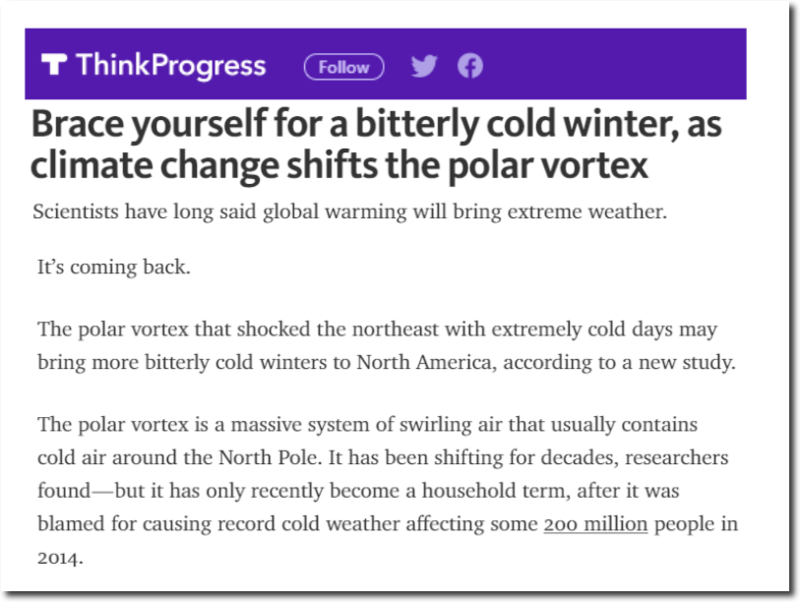 Climate experts now say that global warming causes bitterly cold, snowy winters, and that they predicted it all along. 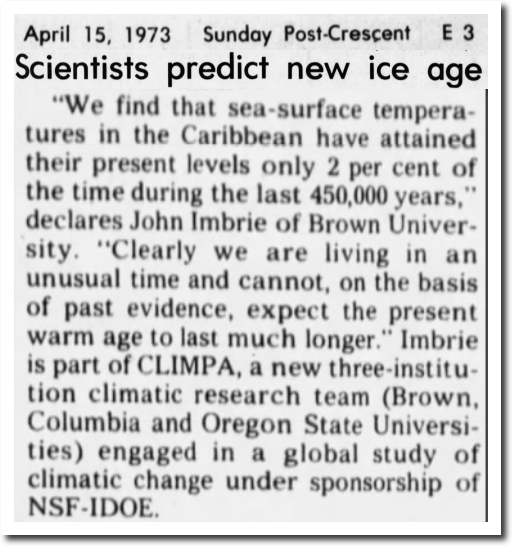 The world’s leading climate expert predicted Lower Manhattan would be underwater by 2018. 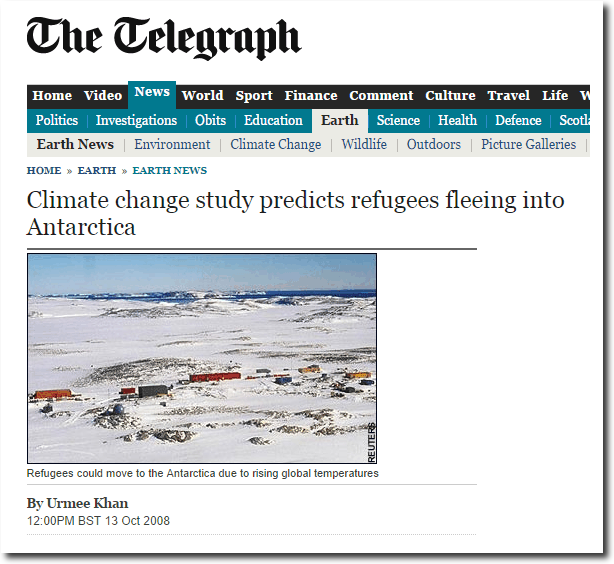 And experts say we will all have to flee to Antarctica to save ourselves from global warming. 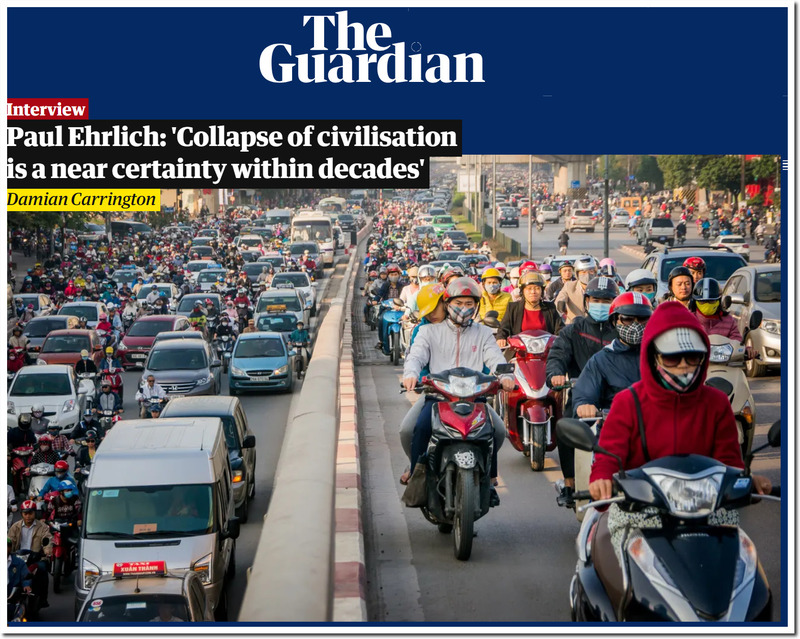 Fifty years later, Ehrlich still says doom is imminent, and that collapse of civilization is certain within decades. 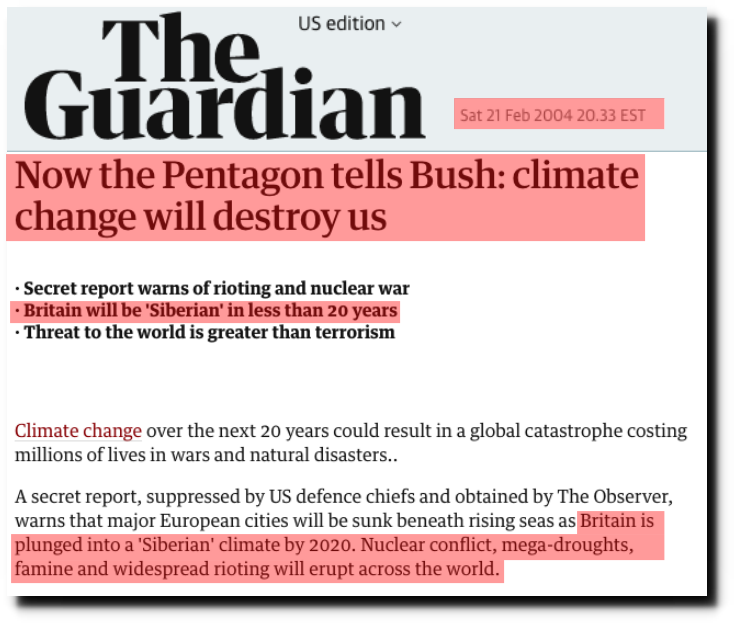 I have hundreds more of these predictions on file, but this is enough to get the point across. 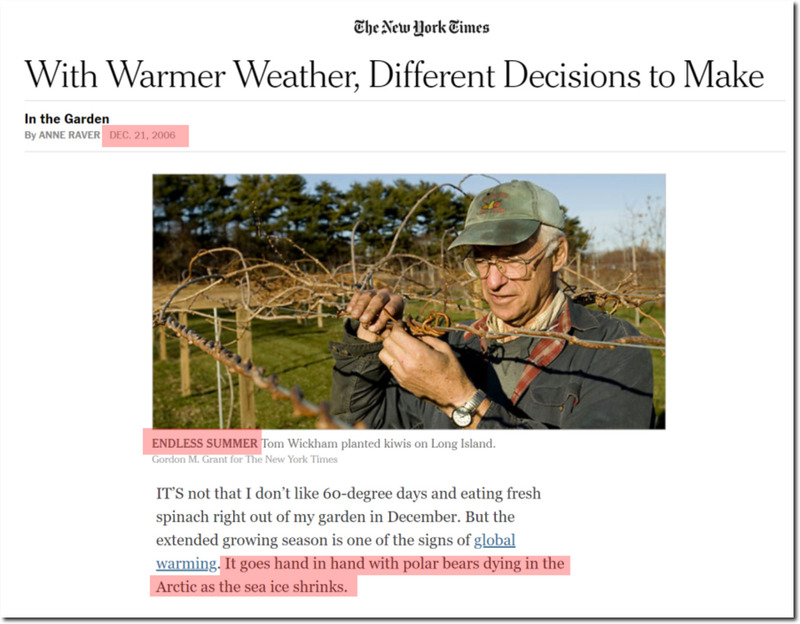 Climate alarmists, and alarmists in general, are incompetent, dishonest hacks – who change their story every time the wind shifts. 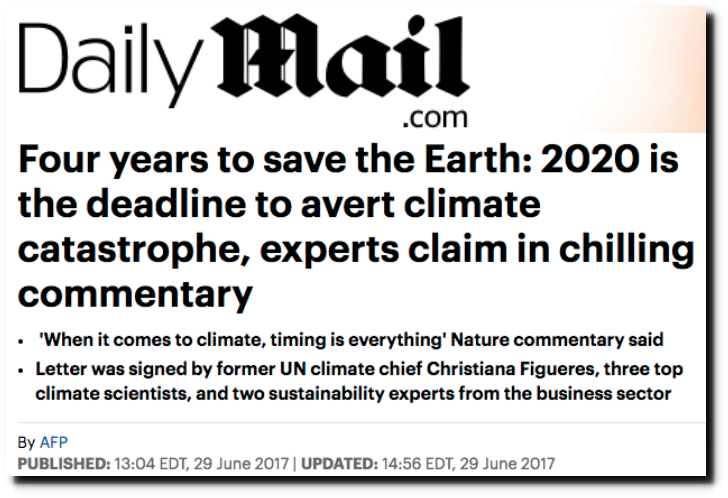 And no matter how many times they are wrong, they never lose credibility with the press.